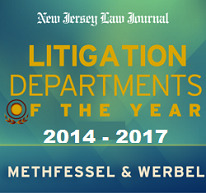 Sarah Delahant joined Methfessel & Werbel in July 2017. Ms. Delahant began her career litigating personal injury cases on behalf of plaintiffs. During her time representing plaintiffs in negligence cases, Ms. Delahant tried multiple cases to verdict and was responsible for several multimillion dollar settlements on behalf of traumatically injured plaintiffs. Shortly thereafter she served as Managing Attorney of the Legal Department at IFA Insurance Company. While at IFA Ms. Delahant handled all aspects of auto negligence and insurance coverage matters on behalf of the carrier and its insureds. She continues her specialization in the defense of negligence matters on Bill Bloom’s liability defense team.